It goes without saying that Twitter is pretty popular. With over 300 million active users on the site each month, it would seem like everyone’s already on it. However, there are plenty of people – and businesses – reluctant to hop on the Twitter train. Maybe they don’t like change. Maybe they feel like they can’t keep up with the latest tech. Or, maybe they just don’t see how Twitter, and other social media sites, can benefit them or their business. There are still a significant amount of people who may think that creating and maintaining a Twitter account is a waste of time. However, Twitter can be a powerful tool in a business’ marketing plan. You can reach a global audience, make relevant industry connections that otherwise might be missed, and keep up to speed on others in the industry – including competition. 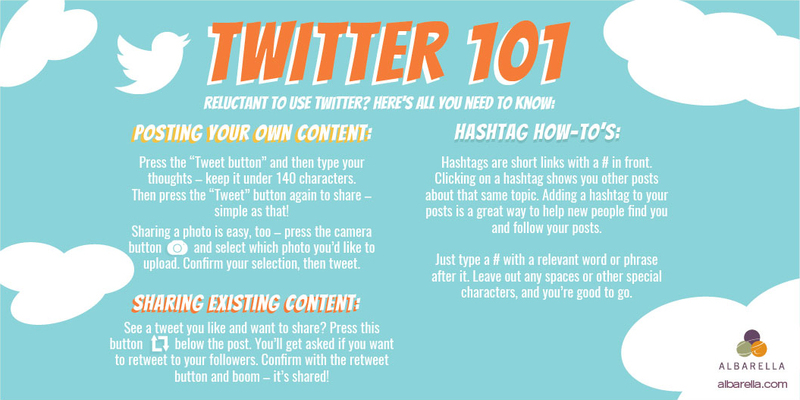 And if they do understand the impact Twitter could have on strengthening their brand, but feel either too late to the game or too behind to want to jump in, just share this Twitter 101 graphic with them. It’s simple to start, and can be an impactful way to strengthen your brand. Contact us to find out how social media can benefit your business!